The XD8s fully integrates your entire sound system and outboard accessories with the included desktop remote control. The XD8s has the capability to handle multiple inputs, and you can switch instantly between your computer as a source or other more portable platforms such as iPods, phones and other media players via the 1/8” stereo Auxiliary input. 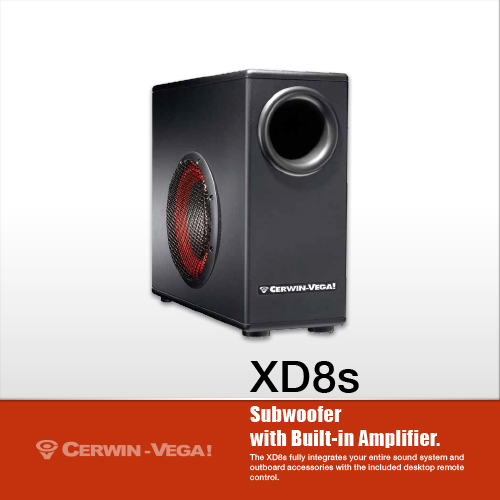 When creating the XD8 speaker for desktop and computer applications the goal is to optimize the sound output while keeping especially the subwoofer enclosure small to integrate easily below your desktop or home environment. At the ultra low level, where desktop monitors reach their physical limitations, the XD8s sub offers deep bass extension, allowing each system to go to a new level of performance. Unlike other desktop speaker systems, the Cerwin-Vega! XD Series is built with solid MDF wood enclosures, allowing it to deliver the same quality of bass as much larger home speaker systems. Signal purity must be maintained by using low noise amplifiers that don’t disappoint when the volume is set to high. And, if it has the Cerwin Vega name, the bass has to be in-your-face. If you are looking for extended bass response, high SPL and an optimally designed port for proper low frequency phase alignment and minimal turbulence, the XD8s is your match. In addition to the standard audio input and outputs, a volume knob, versatile crossover and polarity switch can be found at the rear of the sub for aligning its audio to any desktop monitors. A System Remote connection port is also on the sub for use with the included XD8s Remote Control, which allows for easy volume control of the entire system. Featuring a Volume knob and Mute/Bypass switch, it is also outfitted with an audio input jack. 17.32" x 7.09" x 14.96"